Mount Desert Island's Andrew Phelps (right) avoids a tackle attempt by Bucksport's Cameron Soper during their football game at Carmichael Field in Bucksport in September. 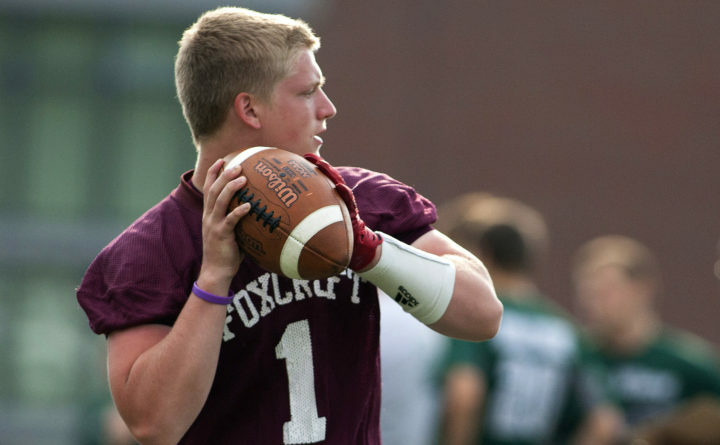 Foxcroft Academy quarterback Nick Clawson looks to pass to a teammate during Hampden Academy's 7-on-7 summer football passing league in Hampden in July. 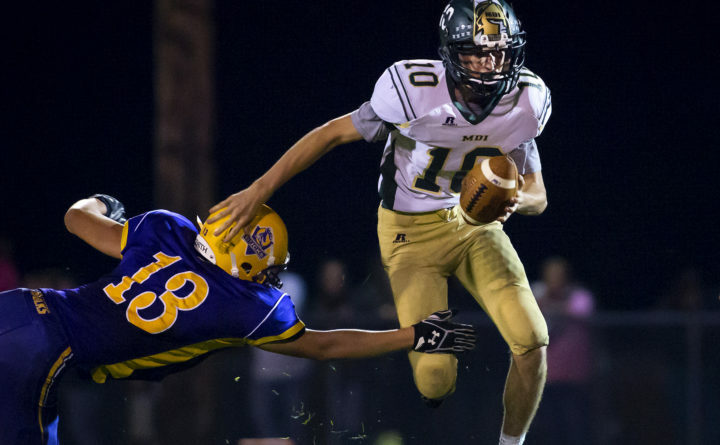 A clash of champions and three solid rivalries mark Week 11 of the high school football season, the North region title games. It’s an interesting mix of contests, with two finals matching the top two seeds in the division, including in Class B North, perhaps the state’s most unpredictable race throughout the regular season. No. 1 Skowhegan and No. 2 Lawrence of Fairfield survived closed semifinals to earn a rematch of Skowhegan’s 58-56 shootout victory over the Bulldogs in Week 7. The other 1 vs. 2 clash will be played Friday night at Oakes Field in Dover-Foxcroft, where top-seeded Foxcroft Academy hosts No. 2 Bucksport. It’ the latest edition of a decades-old postseason rivalry that is being renewed this year after the teams were in different classes for the first four years of the state’s football format. Underdogs, at least according to regular-season records, also have been rewarded with a pair of No. 6 seeds overcoming road trips for both their quarterfinal and semifinal games to play for another weekend. Of course, they’re not ordinary No. 6 seeds. Portland is the two-time defending regional champion in Class A while Class C North finalist Maine Central Institute of Pittsfield won it all in Class D last fall and the previous two seasons. After defeating No. 3 Nokomis of Newport in the quarterfinals and outlasting No. 2 Winslow by a point in last Saturday’s semifinal, MCI faces an even longer road trip Saturday night for its battle of champions at reigning Class C North title holder Mount Desert Island of Bar Harbor, the No. 1 seed. No. 2 Lawrence (6-3) at No. 1 Skowhegan (6-3), 7 p.m. Friday: Both these teams went off script from their regular-season norms last weekend, with defenses carrying the night as Skowhegan edged No. 5 Brewer 18-13 and Lawrence tipped No. 6 Brunswick 17-12. The regular-season meeting, which ultimately was the tiebreaker that gave Skowhegan home field for this rematch, represented a stark contrast offensively. Skowhegan junior quarterback Marcus Christopher passed for 330 yards and wideout Jon Bell scored five touchdowns while Lawrence running backs Isaiah Schooler and Tyler Larouche combined for 364 rushing yards. No. 6 Maine Central Institute (6-4) at No. 1 Mount Desert Island (9-1), 7 p.m. Saturday: This looms as battle of the ground games, with MDI’s T-formation accounting for the bulk of the Trojans’ 40.6 points per game and MCI running at peak form during the last month as the Huskies have regrouped from some early-season injuries. Both teams also have passing games that must be respected, with MDI senior Andrew Phelps one of the division’s veteran quarterbacks and MCI passing for more than 200 yards in its semifinal victory at Winslow. MDI has won nine straight games, including a 35-24 decision over MCI in Week 5 that was 35-0 at halftime. MCI has won four of five games behind the backfield combination of Adam Bertrand, Pedro Matos and Seth Bussell and wideout David Young. No. 2 Bucksport (6-3) at No. 1 Foxcroft Academy (7-2), 7 p.m. Friday: These teams are where they were expected to be when preseason practices began in mid-August. Foxcroft earned the home-field advantage largely based on its 45-18 victory over the Golden Bucks in Week 4. This rematch includes the two favorites for LTC Player of the Year in quarterbacks Nick Clawson of Foxcroft and Chase Carmichael of Bucksport. Clawson has passed for 1,019 yards and 13 touchdowns while rushing for 851 yards and 17 additional scores, while Carmichael set a conference record with 1,573 passing yards during the regular season and now has 1,761 yards through the air with 23 touchdown passes after Bucksport’s semifinal win over No. 3 Mattanawcook Academy of Lincoln. Both teams have other weapons, particularly junior wideout Hyatt Smith of Foxcroft (27 catches, 598 yards, 10 TDs) and Bucksport junior Carter Tolmasoff, who shifted from receiver to halfback last week with starter Lucas Wardwell sidelined by illness and amassed 154 rushing yards and 97 receiving yards. No. 6 Portland (4-6) at No. 4 Windham (6-4), 6 p.m. Friday: These teams battle for the regional title for the fourth consecutive year, with Windham advancing in 2014 and Portland winning in 2015 and 2016. Portland started the season 0-5 but has won four of five games since coach Jim Hartman moved first-team BDN All-Maine basketball player Terion Moss from halfback to quarterback. Windham lost three straight games before defeating Bangor in its regular-season finale, and last week knocked off top-seeded No. 1 Edward Little 21-12 at Auburn. Windham’s losing streak was preceded by a 7-6 win over Portland in Week 4.